Sheet mask swap with Elle ♥ | Memorable Days : Beauty Blog - Korean Beauty, European, American Product Reviews. I lalalapf sheet masks! I did a small face mask swap with Elle from Insideout Elle. 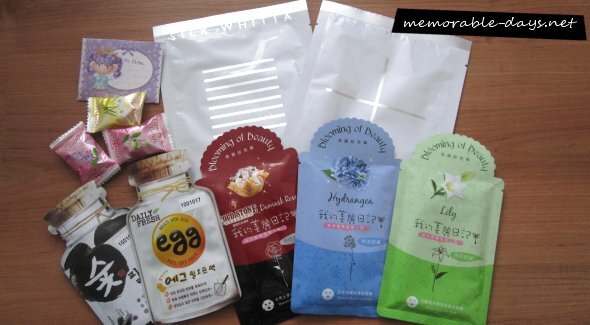 Check her blog out if you haven't ;) She sent me a couple of My beauty Diary masks of the Blooming of Beauty series that I talked about in my previous blogpost, some Silk Whitia masks, VOV masks and some Japanese candy ='D. Those candies were nice hihi ♥. Whoa so many sheet masks that I haven't seen before and I'm dying to try it ^__^. So far I've tried the Blooming of Beauty Lily mask, the cold stone mask is next!!! Super excited to try that one :D, I mean come on who doesn't like cold stone ice cream \^o^/!? I'm also curious about the VOV Charcoal Pack, which is a BLACK peel-off mask. I've never seen a black mask before :).